How well they deliver on your promise to the organization or customer. You submit the application describing your program. You participate in virtual interviews and demonstrations. You may have a site visit. You may submit your application at any time. Organizational membership in ISPI is required and is part of the fee. You participate in an annual audit that uses an online survey and a virtual interview. You resubmit every five years. 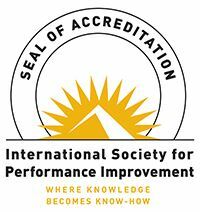 What is different about ISPI's accreditations? Not a member? Click here and join now! Not a paid member? Click here and upgrade now! Or, contact us directly at judy@halecenter.org and we will schedule a consultation to discuss the requirements.